LINZ, Austria: Serbian top seed Ana Ivanovic won the $600,000 WTA event in Linz on Sunday with an impressive 6-2, 6-1 demolition of Russian second seed Vera Zvonareva. Ivanovic, currently ranked fourth in the world after a spell as No 1, swamped her ninth-ranked rival, who at 23, is three years her senior, and never looked back after two breaks sent her romping 3-0 clear in the opening set. She wrapped that one up at the first time of asking then bagged another break to all but end her rival's resistance at the start of the second. She completed the job in just 51 minutes on her first match point. 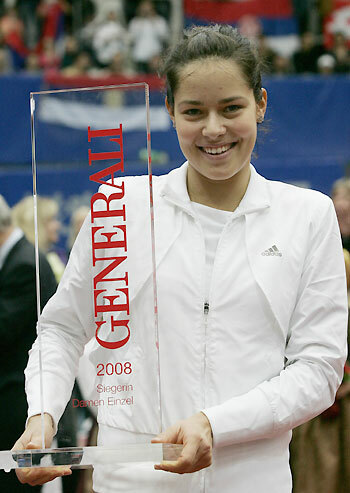 Ivanovic, ten days off her 21st birthday, pocketed her eighth career title and the third of 2008 - including Roland-Garros. After winning in Paris and taking the No 1 ranking, things turned sour for the Serbian pin-up as a right thumb injury forced her to miss the Beijing Olympics, while dragging down her overall level - she went out in the third round at Wimbledon to 133rd-ranked Zheng Jie of China. "When I went out there today I expected a very tough match, and I played well from the first point," Ivanovic said. "I had to be aggressive and put pressure on her and it worked, because I could see she was going for some risky shots. The score might make the match look like it was easier than it was, though - almost every point in the first set could've gone either way. "Every final is a new experience and winning a title is always special," added Ivanovic. In Linz, she had to fight to reach the trophy match as Polish third seed Agnieszka Radwanska took her the distance. But she dug in having lost the Zurich semi to Venus Williams to go one better and Sunday's showing suggested she is now back to her imperious best. Zvonareva remains stuck on seven titles - she won this season in Prague and Guangzhou - but can console herself that she will be in the frame for more at the Doha Masters starting on Nov 4. Also qualified are Jelena Jankovic, Dinara Safina, Serena Williams, Ivanovic, Elena Dementieva and Svetlana Kuznetsova.